Calling all DBS/POSB Cardmembers! Planning to visit WildWildWet soon? Present your DBS/POSB cards at our ticketing counter to enjoy up to 15% OFF Day Pass from now till 28 February 2018. 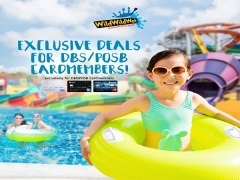 • Present DBS/POSB Debit / Credit Card at Wild Wild Wet Ticketing Counter to enjoy this promotion. • Expired, torn and/or damaged vouchers are not valid and will not be replaced. Check out D'Resort @ Downtown East for more details about this offer and to book your tickets now!